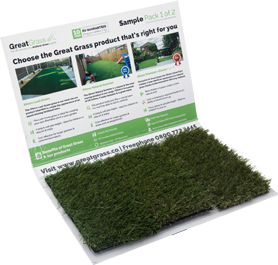 At Great Grass, we’re always looking for ways to create the best product possible! As such, you can expect our products to be hard-wearing and dependable, conforming to the highest standards of quality without compromise. That doesn’t mean it’s got a price tag to match, however, and even if you’re working to a budget we’re sure to have just the thing for you. Our 20mm Natural Spring Artificial Grass in particular is one of our most popular products, and certainly one that comes at an astounding value for your money! As one of our shorter pile heights, this particular grass is skilfully manufactured to replicate a healthy, natural garden which looks as if it’s just been cut neatly. That appearance won’t change, either, as the only maintenance you need to carry out on our artificial grass is a simple once-over with a brush every two to three weeks to ensure there’s no build-up of naturally occurring moss. Utilising a variety of differently coloured blades in each tuft, combined with a natural thatch to really complete that genuine look, our grass also feels every bit like the real thing. Your kids and pets alike won’t notice the difference, and they’re sure to fall in love with it before you know it. Did you know artificial grass is commonly used in schools for that exact reason? Additionally, as you might be able to imagine, a little time spent here and there is a hugely preferable option to the weeding, mowing and fertilising you’d find yourself tackling with a normal lawn, and we can promise that convenience won’t come at great cost! So what are you waiting for? Have you been looking for artificial grass suppliers who can provide nothing but the best quality for cheap prices that work for any budget? Well, look no further! Here at Great Grass, we pride ourselves on our ability to offer a comprehensive range of artificial grass products at that very same fantastic pricing, alongside a dedication to customer service that’ll ensure you won’t be left desiring a thing. We’re passionate about what we do, so why not let us lend you our services as soon as you can? Don’t hesitate to get in contact; we’d love to hear from you!